It’s been a very, sad heavy weekend. Did we see it coming? Reduction in episodes was that a sign of things to come? I am still in pieces and my head is still a mess, even though one day this would have to come. Thanks for these words. I’m still a newbie in the SPN family, less than a year old (hey – Jack’s older than me – lol) and quietly trying to process all of this. I have thoughts and feelings and words all jumbled in my head and heart. And one day, when it’s time, that will all spill out, Till then, it’s articles like this and words from others that help make the hurt a tad bit easier. We will get thru this and we’ll be stronger – we are family! Thanks for writing about the feelings many of us are having, not least gratitude that there will be a final season, that we get room to let go. Lynn, as usual, you have done an excellent job summarizing my feelings about the loss of my “fictional family”. I am very thankful to have been able to attend a few cons & meet “the boys” & others of the cast AND you. We fans WILL continue to be family. Thanks for sharing your feelings & expressing mine. I am grateful for the show. But I entered the Anger stage of grieving and haven’t gotten out of it yet. I’m not angry at the actors at all — I completely understand if they’ve had enough of shuttling between work and family and spending weekends all over the place. 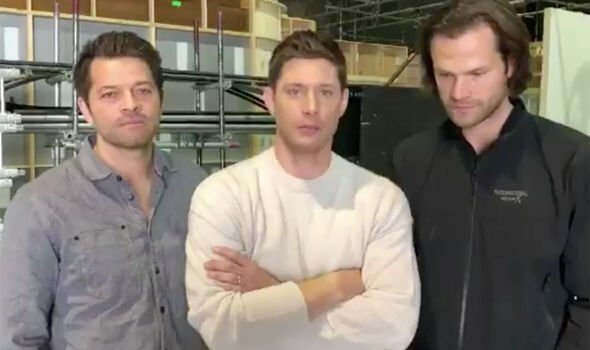 I’m angry at the executive producers and show runner for not coming up with storylines that might keep Jared and Jensen excited about doing the show. For forgetting what came before (did the possibility of a wendigo not even cross the boys’ minds last week? ), for becoming forumulaic, and for cheapening the deaths of important characters by bringing them, or their doppelgangers, back. For not making better use of the AU. Yes, we all loved Bobbby and Charlie et al., but how much better it would have been to develop new characters we might have been able to invest our emotions in. For losing Robbie Thompson and Jenny Klein and whoever else. For never-ending angel-demon drama. Basically, for giving the audience what they think the audience wants instead of giving us something terrific we didn’t know we wanted. I’m glad the actors will be able to spend more time with their families and play a bigger part in their children’s lives, but I really can’t help but think about Jensen’s oft-expressed declaration that as long as the show had a story to tell and that he and Jared were enjoying doing it, they’d continue. I’ve watched from the beginning w/ my daughter & now that she has her own family, she still comes by to watch it together. It’s brought more meaning & emotion after my son died of suicide in Dec. of 2011. “Carry on my wayward son, they’ll be peace when you are done” is now one of my favorite songs. You always know the right thing to say Lynn, thank you. SPN is special in so many ways, it’s our Unicorn and nothing will ever take its place in our hearts. Thank you to the guys for stepping up and delivering the news themselves, they are truly remarkable, when the time comes to say adios to the show, they will get a much deserved break to be with their families, having worked on a punishing schedule most of us couldn’t keep up with, outdoors, in all weathers. As for the future? I don’t doubt we will see them again, due to their endless collective talent and, as I have said to my friends, perhaps Jensen will find the time to make that record we deserve? I wish good luck to all those behind the scenes who will be profoundly affected by this announcement and give my thanks to Vancouver for being a wonderful host / USA stand in. I knew this announcement had to be coming soon, if not this year then maybe next (for one thing, the boys all have young families that they have said they want to spend more time with). I know that 15 seasons is twice or more than what most other shows get. And I am grateful for what we have had. That’s why I was surprised at the level of shock and grief I felt when I saw the video on Misha’s facebook. I sobbed as if I were losing a loved one. This show is so special to me, such a touchstone in my life, the idea that soon there will be no new episodes is a major blow. I am starting to come to the acceptance stage in my grief, although, Lynn, your beautiful post captured the emotions we are going through so perfectly that I found myself in tears all over again. One thing struck me in seeing the tweets from the cast and Kripke talking about the end of the show: no one thanked or mentioned “the fans” the way other shows would. They only mentioned the SPN Family, which is what we all really are a part of. And that family is a beautiful thing that absolutely will not come to an end in the fall of 2020. Thanks for that. You’ve just reinforced what my therapist told me tonight when my grief sucker punched me out of of nowhere during my session tonight. Thought I was ok…apparently I just hadn’t let myself feel the grief. Thank You for this article. It lets me understand my feelings better. I always knew it would be hard on me when that day would come. But I must say I was surprised by the force of emotions that were unleashed on me.It did hit me very hard. I felt very grateful not to have to go through this alone these last few days, that there were fandom friends and even strangers I could talk to on sm. I really learned the value of the SPN family. But your article coming from a professional lets me feel a bit more “normal”. Thank You ! And here come the waterworks AGAIN! Thanks for making me feel validated and reminding me that my feelings about how important this show has been in my life are real. And thank you for reminding me that the very real friendships I’ve made will continue, even after the show ends. My fandom journey began when I read your Fangasm book, but it’s not ending any time soon! I read this entire thing through tears. I am heartbroken … hollow and gutted in fact … but I understand it can’t last forever. That doesn’t make me any less sad tho. 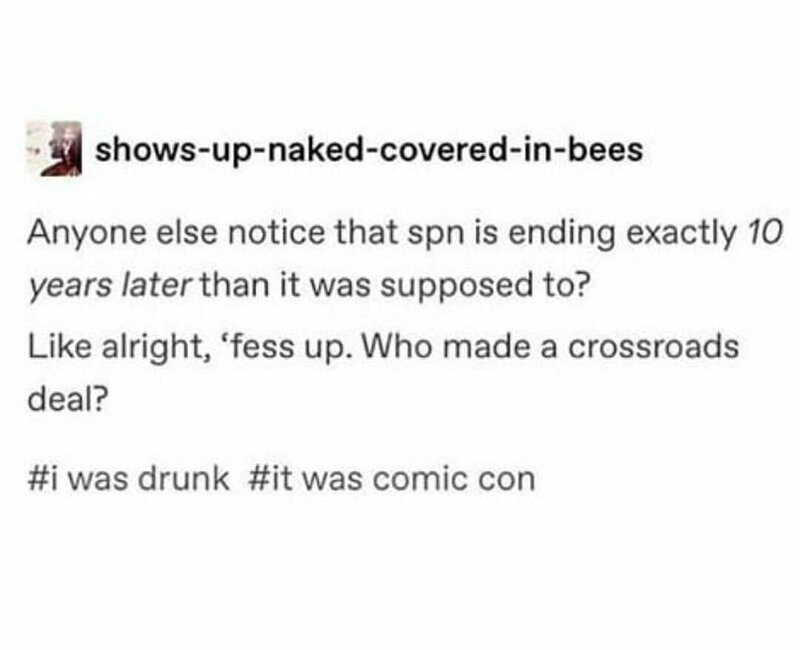 I’d look for a crossroads demon to make a deal if I didn’t know that Jared, Jensen and the rest of the cast and crew deserve to have that much treasured family time. Their children are growing and they need to be a part of their lives now. I am in my 50’s and still need to learn to share, I guess. Anyways, here’s to the final year. May we get a happy ending. Thank you Lynn, your words are always poinient and so filled with compassion. I’ve been waiting to see what you would say, Lynn, because what you say always helps me understand what I’m feeling 😊 It’s impossible to explain how a television show and fictional characters can catch your heart and refuse to let go, but I’ve just learned to accept that it can, they can. I love Show, I love Dean and Sam and Cas and Crowley and Jack and so many, many more. And I am eternally grateful for our time together. Bless you Lynn. 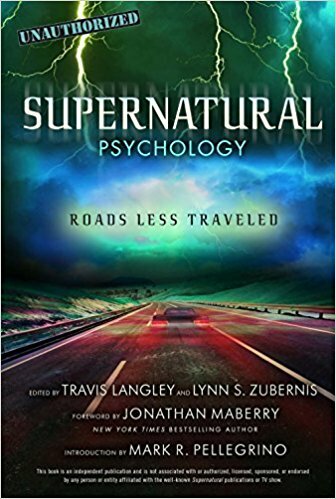 You’re the unofficial therapist for the #SPNFamily. And so I’ve been waiting to read your words. You are, of course, first and foremost a fan but you also understand our fandom in a unique way. And I knew you would have the relatable words of comfort that I needed to hear. I’m still wandering around (emotionally) with how to process and cherish the good that we have now. My first instinct is I want to hug the boys. They’ve been directly responsible for the jobs and livelihoods of so many people. And I know they understand the weight of their decisions in ways many the fandom may not appreciate. Plus they love the characters so intimately. All these thought being out my inner Kim Rhodes to fiercly protective those boys as they make the transition over the next 12-14 months. I hope you are going to SPNLV and are able to share with them our unflagging support for their choices and gratitude for the gifts they have given us. Thank you, Lynn! This pieces resonates with me in so many ways. Thank you for putting this into words for us. Can’t wait to hug you and many other fans at SPNVegas! 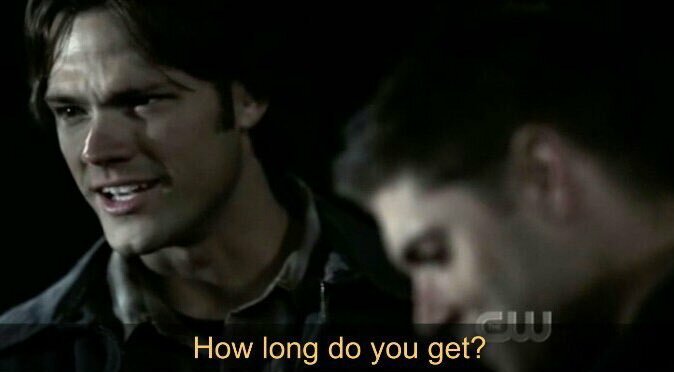 I started watching SPN since 2007. My daughter was just in elementary. 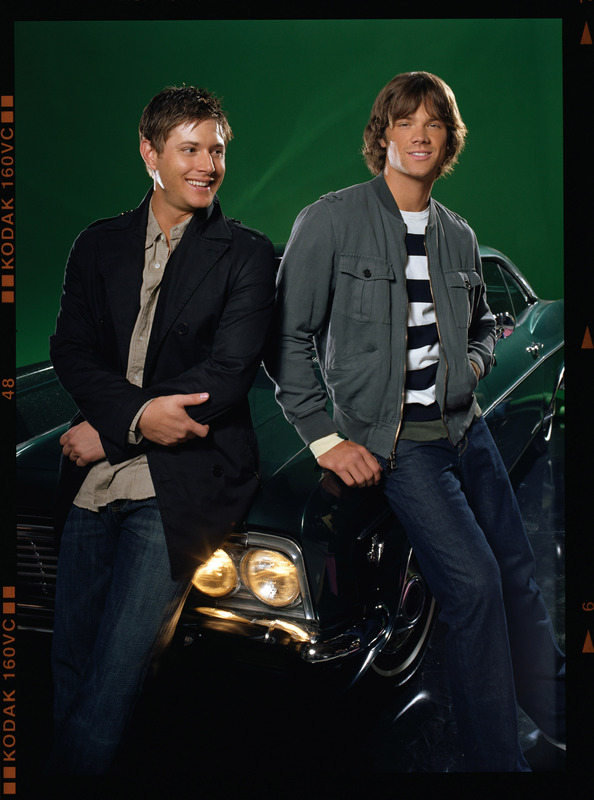 I fell so in love with the characters of Sam and Dean. Their brotherhood is so profound that made the show spectacular. The stories every epidodes were so unique. They always came up with new styles and can even adapt changes in industry and new trends. Writers were so brilliant in experimenting new stories in every episodes. Actors like Jensen and Jared and the rest of the guys are not only ridicoulously handsome but very bright and talented. I just wish someday that they may be given big breaks in the movie industry because they do deserve it. They do have extra ordinary talents that needs to be exposed in the whole world. I love them sooo much. When I watched their farewell clipping. I felt pain in my heart. Its like I lost something very big and important. Supernatural is already part of my life and thinking that it will end soon really has a big impact to me emotionally. 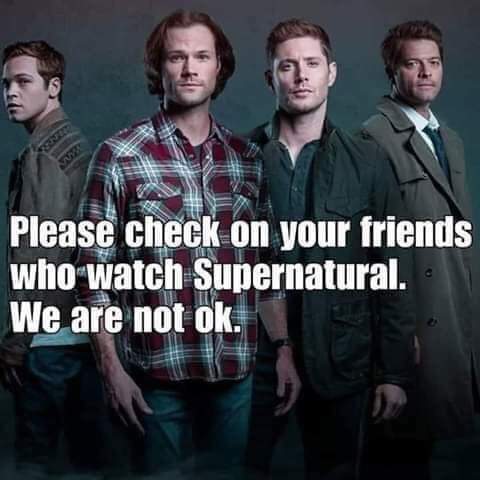 I couldn’t think of any great show that would replace SPN. I know that every show needs to end but Supernatural is the only show that I cherish and will stay in my heart forever. I love you all guys. As always Lynn you have described exactly the way most if not all of us are feeling. As usual, like most days/evenings I was chatting on messenger with my wayward sisters (there are ten of us) when I got a notification that Misha had tweeted, at the same time one of the girls said check J2’s Tweets. For some reason I couldn’t get the video to play but I could tell from their faces that something was terribly wrong. Going back to the chat, I asked what was going on, and so I heard the news from my girls…Supernatural brought us together, but like you said in your article, it’s not what we talk about on a day to day basis and because of that, we will ensure. We’ll still go to any SPN cons of course, but we have and will continue to meet up just for the hell of it because we are family. Thank you for expressing what we fans are feeling. We all know that day will come but when reality knocks at the door we are kind of “no ground”. Although I was not so excited about the storylines lately, the ad knocked me over, After all, I watch them since the very first minute. Let´s enjoy the final year . That every single fan feel themselves hugged! Hugs from a Brazilian fan. Thank you for this post, thank you for the video you did with Alana. As a future social worker (working on my MSW currently) you were eloquent and on the money. I hope to meet you and Alana! 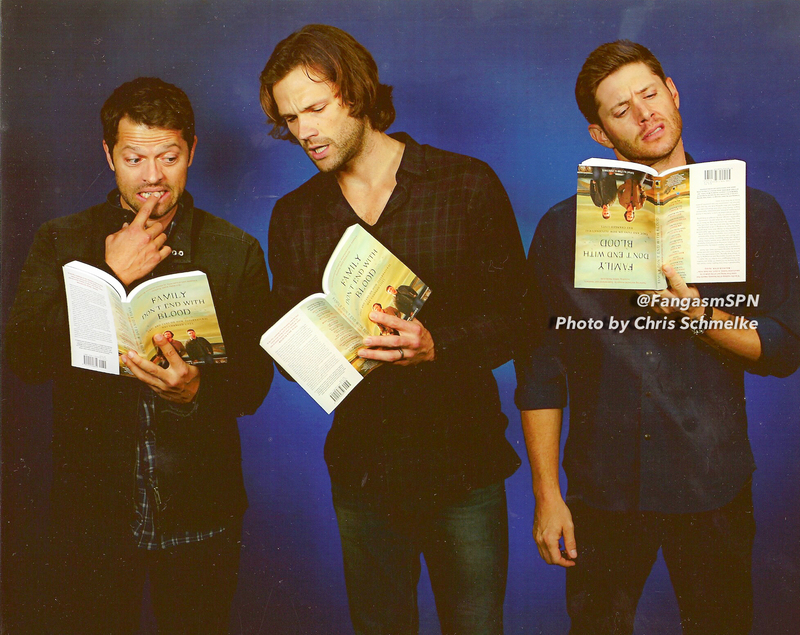 I had just purchased the book “Family Don’t End with Blood” minutes before I saw the video of the sad news of Supernatural ending. Tears came rolling down and didn’t stop for days. 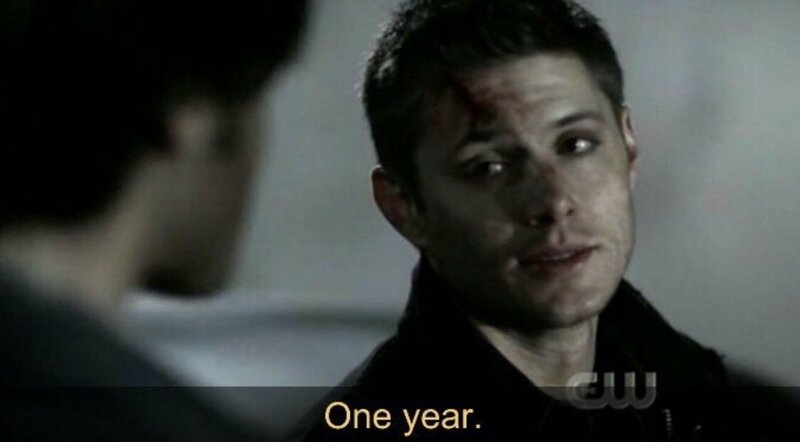 It has only been 1 yr. 3 mo since I started watching this show, in short, it saved my life then and kept me going. I am grateful for finding this show and all the ppl who love it as much as I do. I have watched every episode 6 or more times, it was my daily life. Now I say daily, “Always Keep Fighting”. Thank you so very much for this, giving SPN Family another place to come to terms with the inevitable. I do remember the exact moment I saw the video. I didn’t realize I was crying when I went upstairs to tell my youngest daughter. I do know I had on my Always Keep Fighting shirt, which is faded and so soft as I wear it often. You can barely see the letters but I’ll never give it up. It’s so wonderful to have this family, to know this family will always be here!